Forget boxed up meals from the grocery store. Just imagine using fresh ingredients to make your own meals in a jar that you just need to add water cutting down you prep time but still enjoying a great dinner. 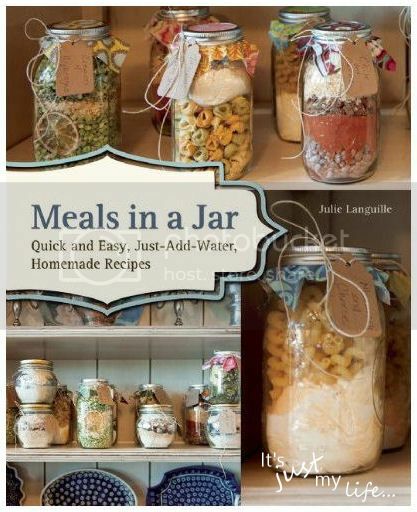 That is where this recipe book comes in by Julie Languille. - White Chocolate Cranberry Cookies and much more! Not only are the recipes in this book perfect for carry-along camping fare, weeknight dinners, meals for Dad or your teenager to prepare, they can also be lifesavers in times of disasters like fires, blackouts or hurricanes. I know the book was intended to be used for putting your meals in a jar but I have also been using the book for cooking for a large number of people because the recipes are large enough to accommodate large gatherings. I do plan on doing up some of the Meals in a Jar for gifts but since our move my time has been very limited due to making this house our home. I know in the end it would save time that seems to be so precious to me since there is never enough hours in a day.